Amazing Amethyst, birthstone for February | Is This Mutton? If you're familiar with the Is This Mutton? monthly guide to the birthstones, you'll know they all have ancient legends and meanings behind them. Perhaps the best known for this is the amethyst, the birthstone for February. Many people are convinced of the healing properties of amethyst, among them, Victoria Beckham, and have it in their homes or on computers, as well as in jewellery. According to Greek mythology, Amethyst was a young virgin who became the object of wrath of the Greek god Dionysus after he became intoxicated with red wine. When Amethyst cried out to Goddess Diana for help, she immediately turned the girl into a white, shimmering stone (quartz). When Dionysus realized what had happened and felt remorse for his actions, his tears dripped into his goblet of red wine. The goblet overturned, and the red wine spilled all over the white rock, saturating it until it became the purple quartz that is now known as Amethyst. The stone is still said today to protect against drunkenness. Some of the many claims made for this violet, purple or mauve stone is that it prevents insomnia (place it under your pillow), helps meditation when worn as a necklace, and guards against self deception and witchcraft. If you want a calmer family - always useful at Christmas - put amethyst clusters, or several tumbled Amethysts, in moonlight and everyone in the home will be feeling more relaxed. 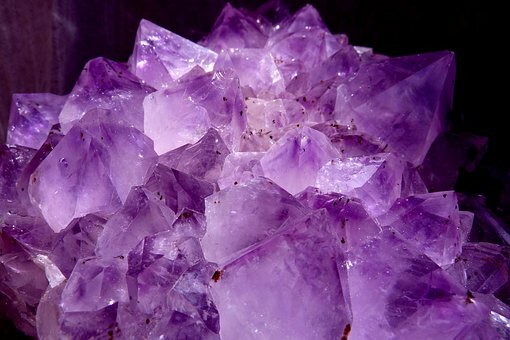 Amethyst became relatively inexpensive after large deposits were found in many places in the 1800s. Before then, it had been prized for rarity.Where it is mined often determines its colour and value. or example, Amethyst from Uruguay has a deep purplish-blue colour, as does Amethyst from Arizona. Amethyst from Russia, colloquially known as "Siberian Amethyst", is very deeply coloured with reddish and bluish tints. It originates from deposits that have since been exhausted and therefore command a high price. Amethyst is faceted into many cuts, and is used in all forms of jewellery including rings, necklaces, earrings, bracelets, and pendants. As with all gemstones, the cost goes up when it is crafted with expensive metals and other stones such as diamonds. There is also controversy around some of the colours available. 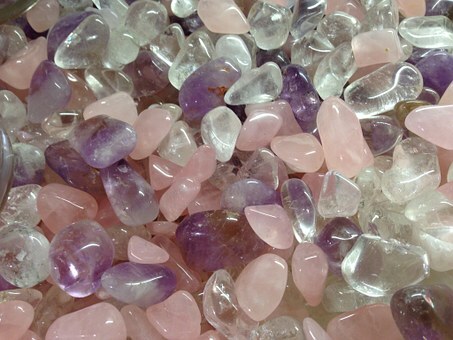 Many pale pink "amethyst" are not even amethyst at all, or may be heavily heat treated to achieve that colour. But there is a pale pink grade known as "Rose de France," although the criteria is extremely tough, as Gemporia explains here. 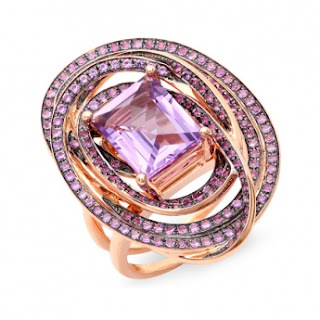 The beautiful ring at the top of the page, in 18k rose gold, features a total weight of 2.75ct of amethyst with a centre stone surrounded by a pave set with 172 pieces of amethyst. Retail price is $4,295 from Tycoon. Many large gems weighing several hundred carats have been cut from Amethyst. Ornamental objects are occasionally also carved from large pieces. Lower quality Amethyst is an important bead gem and can also be cut into cabochons. Tumbled beads of purple Amethyst mixed with white Quartz are also used as necklaces and bracelets. 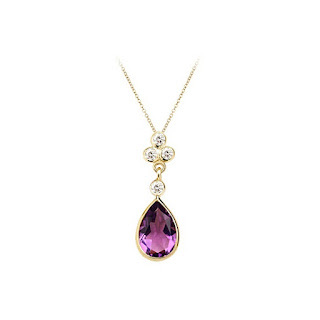 Above: Aphrodite teardrop pendant - amethyst and diamonds set in yellow gold, £750 from Aspinal of London. Above: MVSA necklace in 18k rose gold with amethyst, chalcedony, rubellite beads and pave beads. £20,400 from Bvlgari. Much easier on the purse is the amethyst teardrop necklace by Lily Charmed from Not On The High Street, at £28. Below: Rose de France amethyst bracelet, 14.05cts, in sterling silver, from Gemporia, £214. 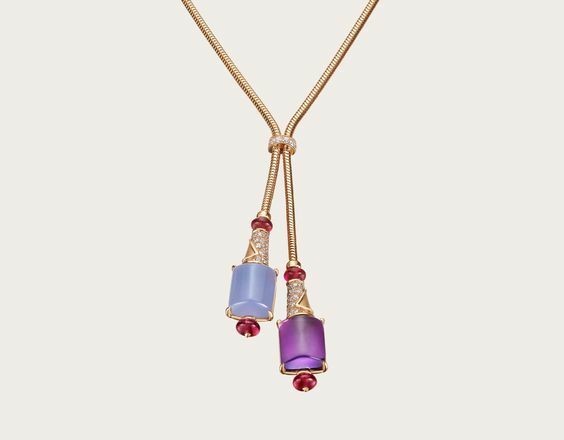 Check out our Pinterest jewellery board, which features more jewellery than can be shown on the blog. A fascinating post, Gail. Amethyst is my birthstone and I'm enjoying being able to wear rings I've had since I was a teen again since Ultra Violet is the color of the year. I'm definitely looking for amethyst pieces to go with my purple obsession! I really enjoy this series. Especially the legend and lore you share. I have an amethyst necklace my father gave my mother and going to put it on this moment to wear with my distressed amethyst-colored tee shirt! I have an amethyst (going to learn how to spell that word properly today if it kills me) in the kitchen window but going to move it to wear I meditate TODAY. 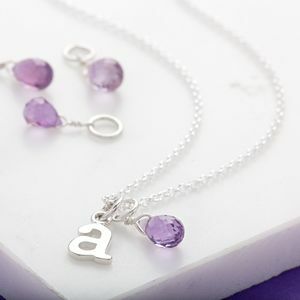 And absolutely going to get some amethysts (spelled it right the first time there) for Christmas peace. Pinning this article and your bling suggestions, too. Love, love this series. That's so lovely to hear Leslie, thank you! I haven't got any amethyst but as Jonet says, with ultra violet being all the rage, I must put that right! Great post. Amethyst is so beautiful. Have a lovely week. Interesting how the idea came about. It may not be my birthstone, but this is this years colour tone. I could wear some of this and be on trend! The colour via clothing looks awful on me, so if I'm going to wear said colour it will be this way!